IHC-plus™ Antibodies ...because seeing is believing! LSBio's IHC-plus™ antibodies have been tested and identified as being optimal for use in immunohistochemistry (IHC) against formalin-fixed paraffin-embedded (FFPE) human tissues under LSBio's standardized IHC-plus™ immunohistochemistry protocol. Each antibody is tested at multiple concentrations on more than 20 normal human tissue types, and when appropriate, multiple normal brain regions and/or cancer types. LSBio's IHC protocol has been developed over the past 15 years as the most optimal method of immunolabeling FFPE tissues, the most common fixation method used by pathology labs worldwide. A LifeSpan pathologist, with extensive experience evaluating IHC, analyzes the localization profile of each antibody, identifying positive and negative cell types, signal strength, subcellular and extracellular staining, and staining artifacts. This information is then compared with all published expression and localization data available for the protein. This enables LSBio to evaluate how each antibody behaves in IHC, including its specificity to the target protein, its sensitivity of detection, and any non-specific staining characteristics that it may display. 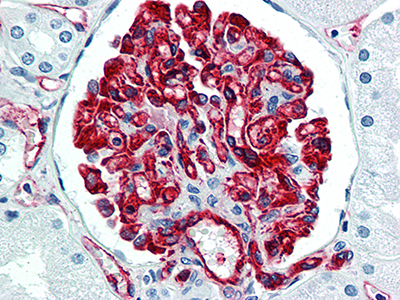 In order to be selected as an IHC-plus™ brand antibody, antibodies must have a close correlation to the published literature, be high affinity, display minimal staining artifacts, and have a high signal-to-noise ratio, such that its specific staining is considerably higher than its level of nonspecific background staining. Learn more about LSBio's Immunohistochemistry (IHC) Validation. Use the search box to list all of our antibodies to your target, and then use the filters to your search by species, clonality, application, conjugate, etc. Alternatively, enter a serach term such as "EGFR IHC monoclonal". Every antibody is backed by our superior Technical Support staff, and every purchase is protected by our 100% satisfaction guarantee.